Hurricane conditions are expected in Hawaii early this morning as Hurricane Lane approaches the island state. Hurricane warnings have been issued for the Big Island, Maui, and Oahu, including Honolulu. The hurricane warning means that the islands can expect hurricane conditions within 36 hours. A hurricane watch is in effect for Kauai country, indicating that hurricane conditions are possible within 48 hours. As a category 4 hurricane, Lane currently exhibits maximum sustained winds of 150 mph. While expected to weaken, it will continue to pose threats including torrential rains, flooding, high winds, and battering surf. Already on Wednesday, heavy rains started to batter Maui and the Big Island, with some flooding noted. Most recently, Lane was centered 260 miles south of Kailua-Kona and moving slowly at 7 mph. Hurricane-force winds are extending 40 miles from the center of Lane. Tropical-storm-force winds extend up to 140 miles from the eye of the storm. Both Hawaiian Airlines and American Airlines have issued travel advisories for passengers planning to fly to or from Hawaii. Reservation change fees for such passengers have been waived at this time. The Central Pacific typically does not produce as many hurricanes as the Atlantic and Eastern Pacific. As such, Hawaii rarely faces the wrath of these types of storms. Since 1959, only two hurricanes made landfall in Hawaii: Hurricane Dot in 1959 and Hurricane Iniki in 1992. Hurricane Iniki, also a category 4 storm, was the strongest hurricane to hit Hawaii in recorded history, causing $3.1 billion (about $5.41 billion in today's dollars) in damage and six deaths. One long-time resident of Kauai, Mike Miranda, remembers that after Iniki, his 7th-grade classes had to be held in army tents for months. Public schools and charter schools are closed across the state on Thursday and Friday, including the University of Hawaii. Most private schools have also announced that they will be closed. 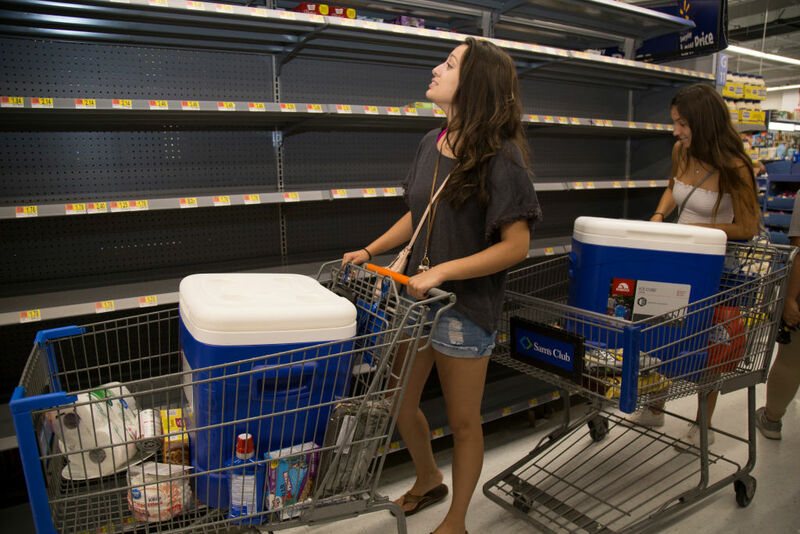 Hawaiian residents have been flocking to stores and gas stations in preparation for the storm's arrival, but they are finding long lines and supplies such as flashlights, batteries, and bottled water running out. Shelters began opening on Wednesday, but there are only 277,376 emergency shelter spaces available in the state with a 1.4 million people population. Emergency officials are getting out the word on how to prepare for the storm, telling people to identify a safe room in their homes. President Trump took to Twitter to encourage residents to "prepare yourselves."